Epeus' epigone: If Google predicts your future, will it be a cliché? If Google predicts your future, will it be a cliché? I wonder if Michael Frayn saw the launch of Google Scribe today, and smiled to himself. In 1965, Frayn wrote a book The Tin Men , which featured a mechanism that wrote newspaper articles by joining together clichéd phrases through a small number of rules. There's an explanatory extract from it in this discussion of why you should avoid clichés when writing Poetry. He opened the filing cabinet and picked out the first card in the set. Traditionally, it read. Now there was a random choice between cards reading coronations, engagements, funerals, weddings, comings of age, births, deaths, or the churching of women. The day before he had picked funerals, and been directed on to a card reading with simple perfection are occasions for mourning. Today he closed his eyes, drew weddings, and was signposted on to are occasions for rejoicing. The wedding of X and Y followed in logical sequence, and brought him a choice between is no exception and is a case in point. Either way there followed indeed. Indeed, whichever occasion one had started off with, whether coronations, deaths, or births, Goldwasser saw with intense mathematical pleasure, one now reached this same elegant bottleneck. He paused on indeed, then drew in quick succession it is a particularly happy occasion, rarely, and can there have been a more popular young couple.From the next selection, Goldwasser drew X has won himself/ herself a special place in the nation’s affections, which forced him to go on to and the British people have clearly taken Y to their hearts already. Goldwasser was surprised, and a little disturbed, to realise that the word “fitting” had still not come up. But he drew it with the next card — it is especially fitting that. This gave him the bride/bridegroom should be, and an open choice between of such a noble and illustrious line, a commoner in these democratic times, from a nation with which this country has long enjoyed a particularly close and cordial relationship, and from a nation with which this country’s relations have not in the past been always happy. Feeling that he had done particularly well with “fitting” last time, Goldwasser now deliberately selected it again. It is also fitting that, read the card, to be quickly followed by we should remember, and X and Y are not merely symbols — they are a lively young man and a very lovely young woman.Goldwasser shut his eyes to draw the next card. It turned out to read In these days when he pondered whether to select it is fashionable to scoff at the traditional morality of marriage and family life or it is no longer fashionable to scoff at the traditional morality of marriage and family life. The latter had more of the form’s authentic baroque splendour, he decided. As I have tried to show, modern writing at its worst does not consist in picking out words for the sake of their meaning and inventing images in order to make the meaning clearer. It consists in gumming together long strips of words which have already been set in order by someone else, and making the results presentable by sheer humbug. The attraction of this way of writing is that it is easy. It is easier—even quicker, once you have the habit—to say “In my opinion it is not an unjustifiable assumption that” than to say “I think”. If you use ready-made phrases, you not only don't have to hunt about for the words; you also don't have to bother with the rhythms of your sentences since these phrases are generally so arranged as to be more or less euphonious. When you are composing in a hurry—when you are dictating to a stenographer, for instance, or making a public speech—it is natural to fall into a pretentious, Latinized style. Tags like “a consideration which we should do well to bear in mind” or ”a conclusion to which all of us would readily assent” will save many a sentence from coming down with a bump. Clearly, Google Scribe has been trained on the vast corpus of English language text that is also used for Google Translate to come up with plausible sentence fragments. Equally clearly, that means it is bound to be plucking phrases that have been written before out of the web for you, and favouring those that have been said most often. It won't come up with a crisp, resoundingly clear phrase for you, unless it has already been said many times before. 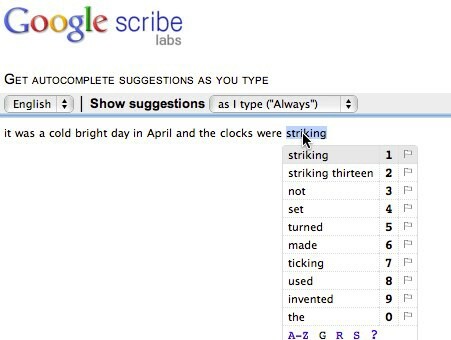 The most likely words to follow “clocks were” now, according to Google, are “striking thirteen”. I hope Orwell would appreciate the irony. Now, this is amusing in itself, but it is also indicative of a wider problem. If you've done much web searching for, say, home maintenance tips, you'll see a lot of prose that has either been written by a machine of this type, or by poorly paid human writers who use a very similar compositional process. We have a kind of mutated Turing Test going on all around us, where robotic writers are trying to convince robotic readers that they are human, and their stilted prose is worth presenting to the real people searching. Of course, the robots are searching too, to get the source material that is fed into their word mills to create this shambling facsimile of human prose. It may be impressive that computers can now write bad prose like so many people do, but I do wonder about Eric Schmidt's grand vision of Google predicting what we will want to do before we think of it ourselves. Will it in fact be what we wanted, or will it be a mishmash of expected behaviours, that we'll regret on our deathbeds? This was the most common regret of all. When people realise that their life is almost over and look back clearly on it, it is easy to see how many dreams have gone unfulfilled. He’s a lout with language. I can’t help somebody who thinks, or thinks he thinks, that editing a newspaper is censorship, or that throwing bricks is a demonstration while building tower blocks is social violence, or that unpalatable statement is provocation while disrupting the speaker is the exercise of free speech… Words don’t deserve that kind of malarkey. They’re innocent, neutral, precise, standing for this, describing that, meaning the other, so if you look after them you can build bridges across incomprehension and chaos. But when they get their corners knocked off, they’re no good any more, and Brodie knocks corners off without knowing he’s doing it. So everything he writes is jerry-built. It’s rubbish. An intelligent child could push it over. I don’t think writers are sacred, but words are. They deserve respect. If you get the right ones in the right order, you can nudge the world a little or make a poem which children will speak for you when you’re dead. People are used to typing questions into a box on Google and getting a machine's suggestions. Increasingly though, they're typing emotions into a box on Twitter or Facebook, and getting a human response instead. It is the unpredictable about humans that I like. For example, I could not have predicted you would write this — and I think it's wonderful stuff at many levels. I think I just read Jaron Lanier saying somethign along the lines that we'll get our Turing Test winner by lowering the standard of what it means to be human. Re: Tony above -- isn't it odd that we talk about the Turing Test as if it were a prize competition? Some of us talk about Scribe the same way -- as if the point were to get the sentence "right," to match (or avoid) the famous phrase, or the one that we're thinking of. It's Scribe's deafness to context that makes it alarming, unintentionally funny, and potentially interesting. On Twitter, Robin Sloan compared it to surrealism; this is a good reminder that when most of us try automatic writing, what we get is a string of uninteresting clichés. Turing's mistake was that he assumed that the only explanation for a successful computer entrant would be that the computer had become elevated in some way; by becoming smarter, more human. There is another, equally valid explanation of a winning computer, however, which is that the human had become less intelligent, less human-like. An official Turing Test is held every year, and while the substantial cash prize has not been claimed by a program as yet, it will certainly be won sometime in the coming years. My view is that this event is distracting everyone from the real Turing Tests that are already being won. Real, though miniature, Turing Tests are happening all the time, every day, whenever a person puts up with stupid computer software. For instance, in the United States, we organize our financial lives in order to look good to the pathetically simplistic computer programs that determine our credit ratings. We borrow money when we don't need to, for example, to feed the type of data to the programs that we know they are programmed to respond to favorably. In doing this, we make ourselves stupid in order to make the computer software seem smart. In fact we continue to trust the credit rating software even though there has been an epidemic of personal bankruptcies during a time of very low unemployment and great prosperity. We have caused the Turing test to be passed. There is no epistemological difference between artificial intelligence and the acceptance of badly designed computer software. This has only got worse since then; in some ways the computers programmed to write and evaluate prose are analogous to the computers programmed to securitize and trade mortagages - they are growing large enough to outweigh and destabilize the human activities that provides their reason to exist in the first place. "This has only got worse since then; in some ways the computers programmed to write and evaluate prose are analogous to the computers programmed to securitize and trade mortagages - they are growing large enough to outweigh and destabilize the human activities that provides their reason to exist in the first place." I'm a sailor and avocational boat builder, and for a while now the idea of free surface area keeps seeming like it means something in the way that ideas slosh around the internet, but I haven't been able to get much father than my own experience in a swamped boat, try to still still enough to not capsize, while still needing to move around enough to get the water out, and somehow sensing that this is sort of like all the information on the internet sloshing this way and that. I know, that's pretty unformed, but the idea that text algorithms could be as destabilizing as financial algorithms gives me that sloshing feeling again. There's another cognitive dimension to Instant and Scribe: query commits may now happen at the level of the keystroke. These experiments only hint at where predictive text is going. Imagine a Google Instant Maps that slides, pans in, reorients, highlights landmarks, and suggests routes by process of elimination without your ever having left the search bar. Given all this, I wonder what becomes of the line between preview and commit. Will there still be a punctuating dimension to Enter, as in, "I'm finished my query"? Or perhaps Enter as way of marking off shallow from deep(er) interest in what you're seeing? Besides the style convergence effect Kevin speculates about, there are opportunity costs tied to each thought dropped or deferred as the autocompletion draws your attention away from querying, towards results. Not that such costs should always trouble us; word processing augmented with WYSIWYG, spell check, auto-save, etc. has if anything improved my writing by knocking down barriers between the interface and my intent. I would hate to go back. Personal note: I used the Scribe bookmarklet to write this post. Arrow key behaviour takes some getting used to. It would be hella meta if we all conducted this discussion with Scribe turned on. Kevin Marks: @CinemaDope Tin Men is chillingly prescient. Time for a new adaptation? Rajasekhar Reddy Mettu: liked this. Víctor R. Ruiz: liked this. Don Wood: Thanks for writing this.